THERE was good news and bad news. The Hobart taxi driver taking me to Lebrina told me that I won’t be disappointed as Lebrina was easily Tasmania’s best restaurant as he had dined there (the good news), but he said (in an almost hushed guilty tone), that it took him weeks to save to go there (the bad news?). Arriving at night at Lebrina in the inner-Hobart suburb of New Town you wonder if you are in the right place as you’re confronted by a charming 183os apricot-brick homely cottage surrounded by a hedge with an iron gate and a short path to the front wooden door. I didn’t know whether to knock or just go in, such is the place as dining at Lebrina is like dining in someone’s grand home. We were welcomed by the matire’d (a charming and softly-spoken gentlemen), who lead us to one of the small dining rooms where two other couples were seated. 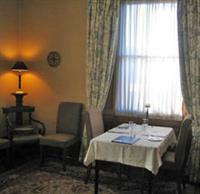 This intimate and elegant dining room (one of three) is part of the original cottage and was decorated with antiques, lamps and modern paintings. Jazz and Parisian-style ballads softly emanated throughout the room over the hushed chatter of the other diners (this is not a place to bring boisterous guests). There also is the sense that you are about to partake in intimate old-school classic dining. The menu is short and heavily influenced by what Tasmanian produce is in season. The wine list runs for pages with an impressive (but quite overwhelming) choice of not only Tasmanian wines but wines from regions around the world. As the menus were presented so was a small plate of appetisers – parmesan biscuits and croutons with tapenade. Lebrina’s May menu featured five entrées: wood-baked cherry tomatoes with a Belstone goat cheese panna cotta and pancetta ($27.50); seared local pigeon breast, cabbage pudding, apple, sage and pig’s ear crackling ($29.50); double-cooked Heidi Gruyere cheese soufflé ($27.50); an eggplant imam bayeldi which is spiced eggplant with fresh coriander, mint, yoghurt and wafers ($27.50); and seared local abalone with comfit pork cheek, celeriac salad and shallot jelly ($29.50). I chose the seared local pigeon breast ($29.50) – my dining partner (never usually hungry nor a bon vivant), passed as she was saving her appetite for dessert. Pig ear crackling – why not? These thin, crescent-shaped stands were crisp and chewy – but lacked the full flavours that you get from perfectly roasted and salted pig skin and that nice soft fatty underlayer. That’s not a bad thing – typical pork crackling would have been too overbearing and heavy as an accompaniment to the beautifully seared crimson pigeon that sat on a apple and sage flavored purée with a cabbage pudding “dome”. The slices of pigeon breast had been lightly seared – the gaminess of the meat and its jus marrying well with the slight sourness of the cabbage pudding. The apple and sage added an extra dimension – the woody flavours of the sage combined with the acidity of the apple giving the dish an awakening. Again, there were only five dishes as main courses: wood-roasted king fish fillet (line caught) with cracked farro, fresh herbs, lemon and local olive oil; crisp duck fillet with la peara and shitake mushroom; baked clover country lamb neck with English spinach sformata sauce paloise and pan juices; seared venison tenderloin with chestnut puree and fresh horseradish; and beef fillet with an oxtail broth with Parmigianino gnocchi. All mains were $45 and come complete without the need for side orders (meaning the mains came this evening with beans and potato both served in a small copper saucepan). 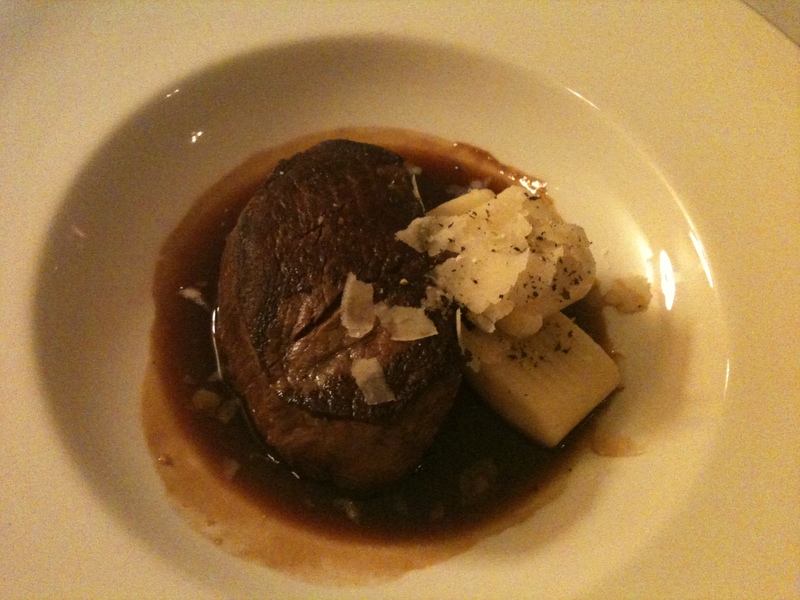 My main was the beef fillet witth ox tail broth and parmigianino and potato gnocchi. The beef was a large thick round of tender fillet, cooked medium to rare surrounded by a rich and well-seasoned oxtail reduction. Large, square gnocchi flavored with Parmigiano cheese and shavings on top made this a rich, hearty and sophisticated winter meal. Extra bread was offered to soak up the juices and was not refused. I recommended the dish. 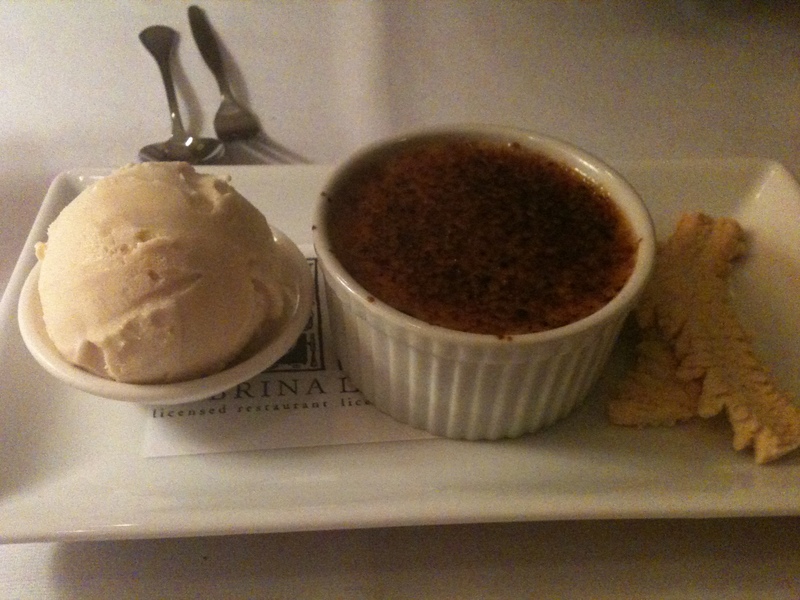 We decided to share a desert – the malt crème brulee with caramelised honey ice cream ($18.50). It was exceptionally creamy – the subtle malt flavours combing with the richness of the caramelised honey flavour created a malteaser honeyed sensation. Sweet but not too overbearing or heavy. A classic dessert revved up to another level. We left Lebrina feeling not only spoilt by our charming matrie’d but also overindulged by the well-executed dishes from the kitchen. Now back to my mate the Hobart cabbie. As is the case with taxi drivers you only believe half of what they say. Yes, the meal was magnificent but considering the charming and attentive service, quality ingredients, attention to detail and the overall sophistication and intimacy of Lebrina, it is a dining experience well worth saving for without having to feel guilty. The verdict: Owner and chef Scott Minervini has created an intimate and sophisticated atmosphere where he serves European-inspired dishes with quirky touches dominated by the use of Tasmanian seasonal produce with genuine, warm-hearted service as part of the experience. 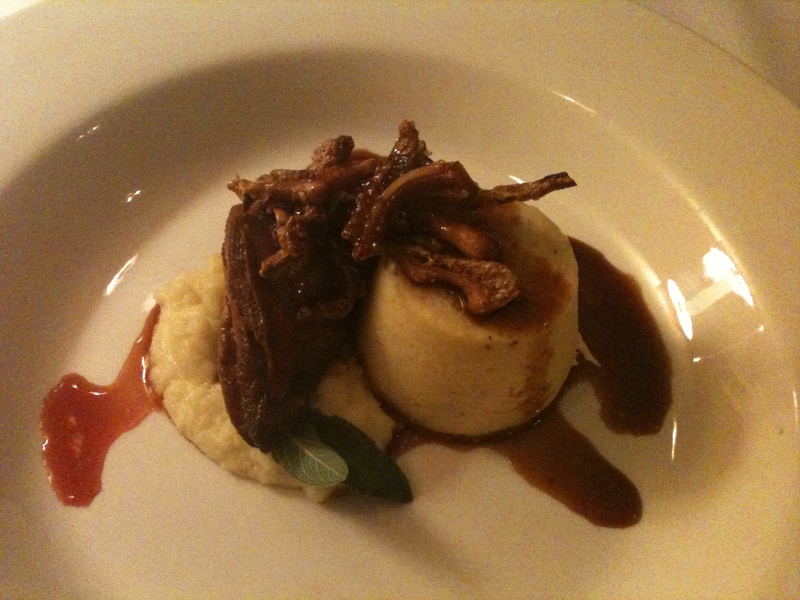 What: Lebrina Restaurant, 155 New Town Road, New Town (Hobart), Tasmania, Australia. Phone (03) 6228-7775. Open for dinner from Tuesday to Saturday. Ate there: 12 May 2011. On 28 April 1996 at the historical Port Arthur site in Tasmania, 35 people were tragically killed. Two small children, Alannah and Madeline Mikac, aged six and three, along with their mother, died that day. The Alannah and Madeline Foundation, a national charity, was created in their memory with the belief that all children should have a safe and happy childhood without being subjected to any form of violence. The Hungry Bon Vivant supports the important work that the Alannah and Madeline Foundation does, its vision and the issues it seeks to address. For information on the Foundation’s work and vision click here. This entry was posted in Fine dining, Hobart, Modern European, Tasmania and tagged Australia, fine dining, Food, Hobart, Lebrina, Modern European, Tasmania. Bookmark the permalink.